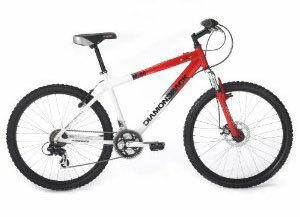 The Diamondback M05 Cross Country Mountain Bike is now discontinued. You can find similar bike here. The Diamondback M05 Cross Country Mountain Bike is such a smooth rider that is perfect for off-road trips that makes your cycling life more enjoyable. Its frame is made from strong and aluminum materials that is very much ideal for your cross country trips. It has 21 speed gears that have Shimano rear derailleur perfect for your everyday trip; be it just roaming around your neighborhood, running an errand and going to the grocery store or even bringing it along with you when you come visit some trekking places. It is so versatile that you would not ask for more!